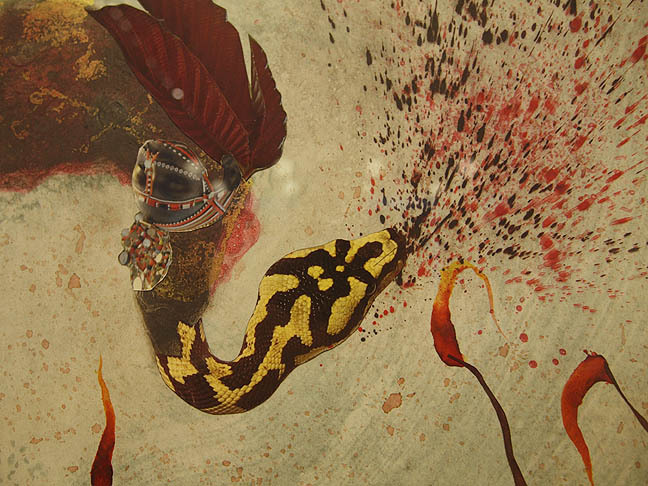 Hailing from Kenya but studied in the United States, Wangechi Mutu is internationally renowned for merging anthropology, interwoven traditions and surrealism through experience as a different often more empathetic approach to the visual representation of women. 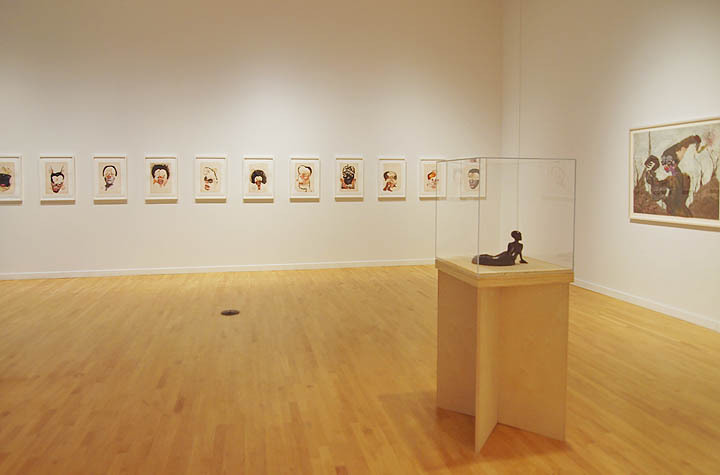 Recently, she sat down with PORT's Victor Maldonado to discuss her exhibition The Human Hybrid at PNCA, the inaugural show of the new Jordan D. Schnitzer Exhibition and Visiting Artist Lecture Series. Victor Maldonado: How did you find your installation of your exhibition; The Human Hybrid? 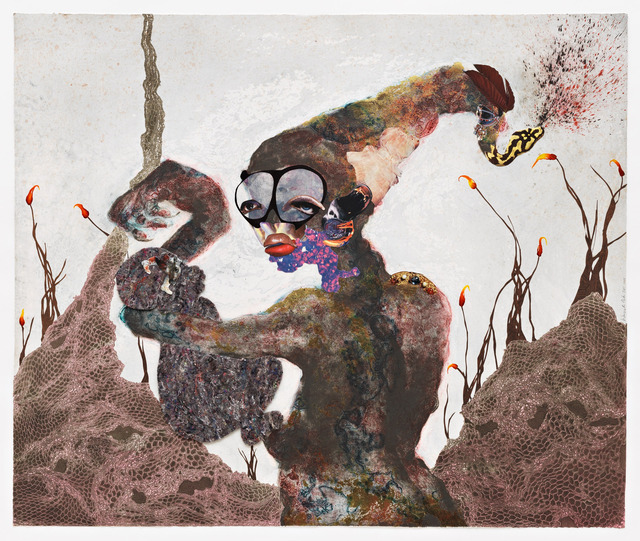 Wangechi Mutu: Oh, I love it. Yeah, its beautifully done. 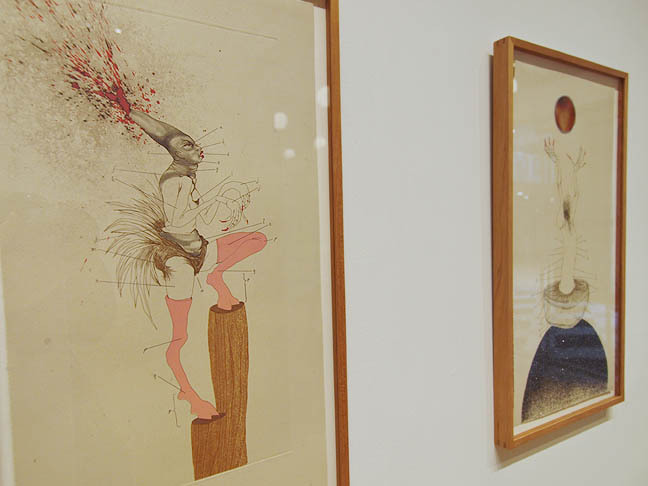 It is a small, elegant show and its serendipitous that this collector happens to have almost all of my prints. There are a couple of things he doesnt have but its wonderful. W: Its very satisfying. I mean, Ive been making the work that you see as you walk in on the left... medical illustrations, essentially the histology series was made in 2005 on an actual Victorian print, these twelve different gynecological diseases and issues with the female reproductive organ. So, that whole moment is, you know, ten years ago, so its good to see this work living, breathing, looking better than when I first made it. V: It has a lot of impact? W: It has a lot of impact, so thats always really good, but I think what is also important to me is that there is this kind of consistency, that Ive been exploring a certain area of thought and interest in terms of material and subject matter. I mean, it holds together really well. 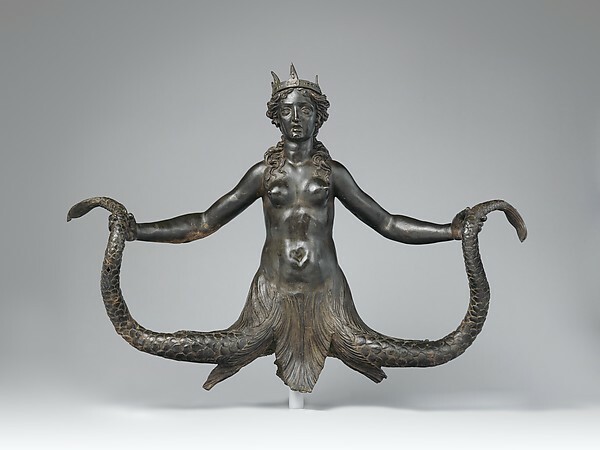 The most recent one is a bronze and that is the new series of water goddesses that Ive been thinking about as an extension of new mythologies and ideas on how to represent the female form. Ways that weve never seen before. I love swimming and I love the ocean. Also, I like mythology that sort of attaches the female body to the ocean. So, it was great to come up with a figure that fit into that interest of mine and also that it looks good. Interesting enough, the first one I made an edible version of her. So shes actually called Chocolate Nguva and the original edition was actually edible chocolate. 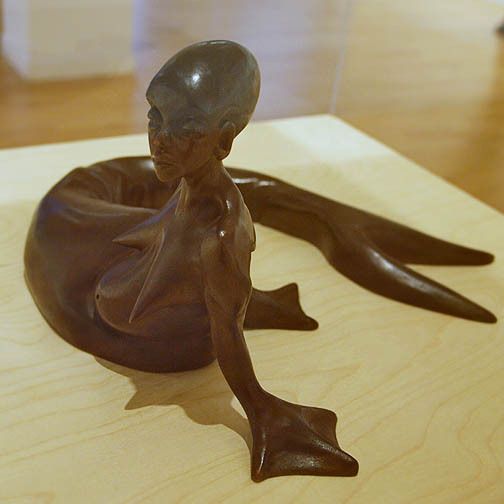 W: Well, funny enough the reason that I started exploring water woman, in particular from Kenya, there is an actual mythology based on, a whole set of mythology and stories, based on this particular female form. I say female form because she is human on land and in the ocean she turns into this animal called a dugong. A dugong is actually real and endangered animal on the on the East African Coast. But they also go all the way to the Pacific so you can find them in Australia. I saw them in an aquarium there. They are these beautiful, big, chubby sea cows and they get hunted and they get eaten because, apparently, they are very delicious. V: So do you see storytelling as the activity you want your collages to enact? First of all, shes a virgin and shes able to give birth to a man and also she is pure and she is beautiful. So this is something that appears in many, many different cultures. Similarly, I knew that the water women story had to exist all over. In any coastal culture there are water women myths. The thing about East Africa is that we have not imaged this myth. 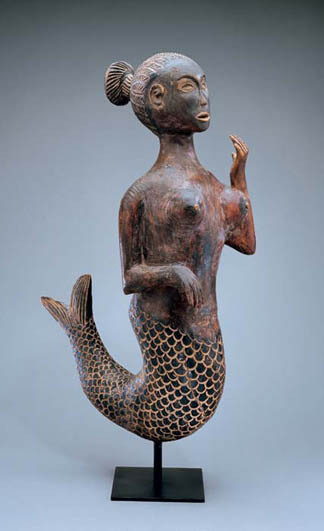 There is not enough of an image history of her so East African culture only has the Yemojas of West African culture, which are so prevalent that they have actually translated into the diasporic cultures in Brazilian and Jamaican cultures that the Yemojas end up there on that side of the Atlantic. So, the trans-Atlantic African slave trade made it so that Africans brought their mythologies there. I became really curious what does our myth looks like, this alluring, powerful, terrestrial and aquatic being? She has a very particular way. When you hear the stories she has a very particular look. People on the street talk about seeing them, you know, which is crazy and wonderful when people are still holding on to the mythology in that way so it is alive in the mouths of people. V: Well, the way you talk about it, it seems like a kind of code and before we can tell stories we have to have very succinct images that guide our way through there. Its very apt to what you talk about. If you were steeped in anthropology or history you might or might not feel that free to play with the design of myths. V: One takes myths and assumes that no body made them and that they were always there. W: That they were always there but they were made by someone and it is interesting that the people and the cultures that made them, not to say that they are not original but they always kind of fall back on the same motifs. The phenomenon is something which I find amazing and powerful. That is what Im going for. Im looking for these trends. 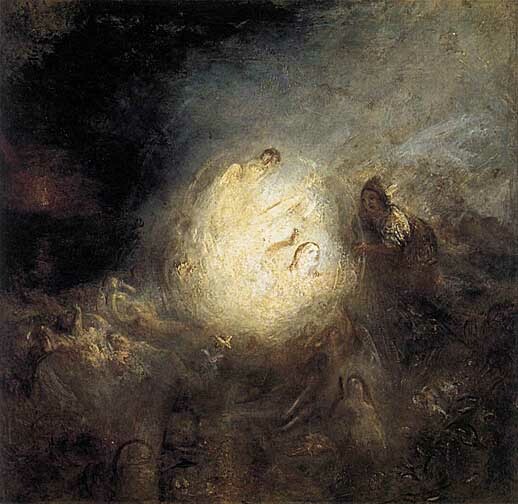 For the reasons nativity goddesses look a particular way and show up at different part of the year and how that turns into Easter that show up during the harvest season, whenever it is. And, then there are these water myths that also produce females of a particular kind and they are all also hybrids. You know the kind in Ireland are kind of like seals (Selkies) not fish and the Scandinavians have the fish version. I love that kind of legitimization of how our brain seems to create or resolve our humanity. It grounds us here in the way weve been here for this long and about these things that we are afraid of and why were afraid of them. Now what Im particularly interested in why women play a role as an especially frightening creatures in very particular ways and in different ways from men. I think men play similar roles but Im very interested in the female goddesses and the female mythology. V: And the aesthetics of power associated to females in mythology as well? W: Correct. Exactly and especially the power that lies deep inside the fear, the fear factor, a lot of it is about that these woman are powerful so we have to be scared, they are beautiful so we should be afraid of them. They are witches so we have to be afraid. V: So, where is the power of eating one of these beings? W: Well, Im being an artist at that point. My thing is we do consume of the black female body commercially and intellectually and visually. And, this is a body that is devoured, in my mind, in ways that are not respectful and so in that moment of eating and devouring, consuming of the black female body we are agreeing to the fact that she is not as valuable. I guess it is not as coveted as the white female body. Im thinking about very much in a critical fashion you know? So, what I wanted to do was have everybody in the show eat of this myth and this story and this body and agree that we are all playing a role in both the dehumanization of the body but at the same time in agreeing how delicious and whatever. It is chocolate, so it is kind of like a double-edged sword and I made sure that anybody that wanted to have a sculpture had to bite it or lick it. You couldnt just take one, you werent allowed to collect without partaking. V: Complicity and recognition? Bell Hooks really talks about that in Eating the Other. 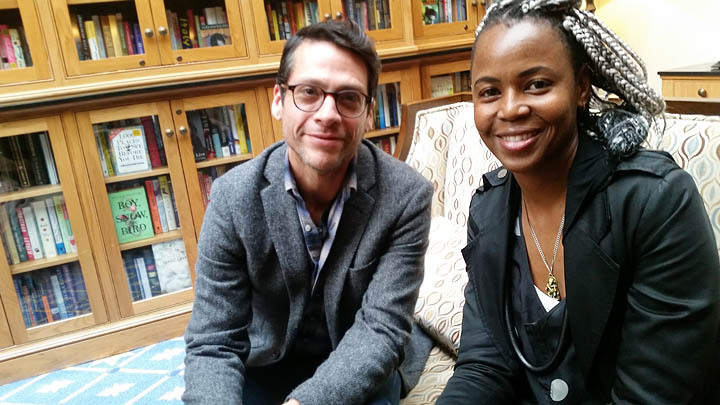 W: Yes, she really is one of my heroes. V: Not that your work is illustrating any ideas that Bell Hooks brings up about gender, power, normativity but really how at large scales cultures are different things than on an individual basis. And, there seems to be an individual exchange that only on strange tools like your collages can enact. That kind of experiential insight, like you dont know how something tastes until you put it in your mouth. So it becomes a very cult activity. We do it every day. But, I think building on you ideas of womens bodies as a myth driven design object in terms of desire, power, fear, beauty but also, I think, as Bell Hooks would say, once I stop fearing it then its about sexualizing or putting it in my mouth. I think in her essay talking about a black and white dichotomy that you may find at top tier Universities in terms of the kind of cross-cultural pollination that can occur intellectually at Universities and what does it mean to know the other? Do you resist it? Do you accept it and how do you accept it? I mean, how much are you thinking about those forces? W: I also have a Catholic background so this notion of eating the divine in order to gain transcendence and join God is very much in place in Catholicism. V: So, take me there. How do you see your work helping you transcend some of these things that were talking about? W: I think its about understanding that we are all participating. As you say, were complicit in the unsavory elements of our culture. Be they issues of violence and war and how womens bodies are violated. I question them but I also try to go as close to the issue as I possibly can of course without participating in any kind of hurtful behavior. When Im thinking about war, when we desecrate the environment Im always questioning. So I could stand up here in my lofty studio and say you are doing this and you are doing that. But we all in it. We are all somehow participating in it because we are of this time and we havent made enough decisions as a collective to change things, right? So thats why were still producing images of women in a particular way. And, Im not saying Im not working against it Im just saying that there is something about humanity that works together. That we create social contracts that eventually change how things are done. But instead of critiquing it fully from the bleachers, from way back, I try to create these sorts of rituals that allow me to get as close to it. So with cutting I try to enact what I thought what may have happened during the massacre. Now, I have no experience or in harming or doing anything awful to a body but I know that the craziness about that genocide is that I could say, oh this could happen in Germany or Iraq and whatever, is that first of all those people are very close to my people. Really very close in terms of geography. Our history is very similar in a sense that weve both been colonized. Establishments that are foreign place themselves inside of our culture. And then of course we are farmer people so there is this element of food and lack of resources playing a role in creating a very desperate environment, right? And, then propaganda of course and colonization adding these racial, hierarchical issues, that were part of life and that these people believed that certain people should be killed and others shouldnt. Now, when I went out to do the cutting on the border in the Presidio, in the border between the United States and Mexico I was thinking about farmers and laborers and what women do, most women do all day long. You know, how they work with their bodies, how they feed their families and how thats a kind of essential and primal. There is no distance between life and feeding. Youre going to get food to keep your family alive and if you dont they wont be alive. And, those tools that are used to farm are also used to arm and certainly the women were actually not as responsible for the killing as they were more on the other end being the violated and the victims. But, I do try to think, well what if I was the perpetrator? What if I was the young man who has somehow been duped into thinking this was the appropriate way? To behave that I need to annihilate an entire ethnicity? You know, whose to say I wouldnt have if I wasnt born into the right family, a particular family with an education and the ability to run out of the country when the war started? I would have maybe found myself with a machete in my hand, too. So I try to think about those kinds of questions as well. And then, I think I look at work like these amazing testaments, these kinds of moments of war and hardship. I love Picassos work as much as I find him extremely problematic... in La Guernica we have one of the most powerful pieces and I try to think how is it that? What was he thinking when he created this work? How it was created? How it reminds me again of those African motifs Im also excited by and interested in? At the same time I go, oh my God, were still doing the same thing. You know that was then but has it changed? V: I think its something that gives your work impact is that like Picasso you are using the artists eye to look at the world. V: Which is not an eye that judges but that asks, do you see what I see? W: Yes, its an eye that looks from different angles which arent always all critical. V: When I learned about Cubism in school I didnt realize that it would be the mechanism that could help me upset colonization. V: Or any type of monotonous single vision. V: And, I think that one of the things that your work allows me to realize, thinking about the multiple sources that these mythical women that you create come from is that Cubism isnt just about the artist moving around the room in space but your work is about multiple voices creating identity at the same time. And I think that even thinking about the span of time that Jordans collection has been brought together there is a wonderful consistency that emerges and it doesnt seem like youre waning from this approach. It feels like youre gaining speed and becoming more biting in your movement in terms of really upsetting these colonial motifs that separate us. Really those kinds of symbols unite us as different kinds of cultures. Is that something you brought to your studies in anthropology or is that something that studying anthropology gave you? When did you have the sense that sense about people... that we are not one thing in a vacuum but that we are fluid and changing? W: I came to the States to study art and anthropology and I it was actually very lucky because it was available because the New School is divided into the different universities. There is Eugene Lang, there is a graduate school, there is a music school and then there is Parsons. So, when I applied to Parsons I was told that of course you could take a couple of classes in cultural anthropology but youre more likely to be successful if you do it in a BA or BFA program at the New School so thats what I did. The reason I was doing it was because, yes, I wanted to find a way. I wanted to find a language that describes human behavior within culture. So its not so much sociology and psychology and also evidence of our behavior so there is cultural anthropology where there are things that we have made over the centuries and years and thousands of years that serve as evidence of our intellect growth, our cultural differences, our existence here. Were not just animals. We are here making things to prove that we are human and then we look at those things as say look humans were here, to prove, we use them as scientific artifacts, that allow us to time shift, to look back in time and read ourselves. But, then I also wanted to think about how do we study human behavior when we dont know the people? So, you have to learn the language in order to study people and come up with these matrices to study people and you realize you are just applying your standards and your language and your ideas to what they are. So everything you are analyzing is actually relative and completely subjective and based on the subjectivity of the person who is studying them. Of course, the best thing about studying anthropology when I did it is that it was being deconstructed. It was kind of being torn apart and opened up and so a lot of what we were studying was that a lot of the people become very much the people who they are studying. So I was really interested in and in love with people like Maya Deren and her work studying Haitian culture, which became very critical for me... again with the Catholicism thrown in there and the diasporic element and then the issues of race and movement of Africans. All this stuff was so important but still she (Deren) was this anthropologist who went to Haiti and studied Voodoo and she became a practitioner and I was very curious about that kind of thing because it obviously means that we are affected by the things that we are learning and that everything is cross pollinating as it grows in knowledge of other things. Thats the only way. So that the purity of Western art and Western history was falling apart as I was understanding anthropology better. So, it was looking at it from different angles but it helped me grow my muscle, my sort of post-colonial mind muscle, and then it helped me grow my work formally because I realized that these are fractured histories and they are puzzles. They look whole and they look seamless but they are full of multitudes of parts. Then of course we could talk about who writes history and how we all know that the winners write the history. V: But, very few people I know sit down and discuss history. History is one of those things, like myths, that is just received and often times not questioned or investigated or observed as a design object. W: Correct and I think in art it doesnt happen as much, but I think historians think about it quite a bit. In fact, Post Modernism was this kind of taking aim at the purity of intellectual practices. But I think art history is now, or at least the people I know, are working extremely hard to figure this fragmentation out and to look at art history as a kind of river with many tributaries and also that tributaries come and go and that it parts ways in some cases. But I think for me as an African coming in to the North, rich, West, when I did I needed to find my confidence, I needed to find my voice. I needed not to be squashed under this kind of very white history that I was being taught in school, which in fact wasnt legitimate because I also came to the States at the time when the Black Male show was put up by Thelma Golden and then all of these really very powerful black artists like Glen Ligon and Carrie Mae Weems and Fred Wilson who did the mining of the museum and Fred was my teacher at the time. So Im looking at these institutional critique artists undoing this fabric of what is considered the perfect fabric for art, white art history, and Im realizing, oh okay, so we have a role to play in rewriting this. And, in fact someone is writing this history and its just not falling from the sky on a scroll, you know? V: And that like art, history is a series of aesthetic choices that are based on values? W: Yes. Standards and values and they are constructs. JJ: There is a process, one of syncretism that Catholics and Vudun know all about and it isnt just visual art that is being made syncreticaly but History. Real History is being made through a syncretic process of accumulating beliefs, values and stories. Also, the generation I came from out of Kenya, right after independence, is a wonderful, optimistic, moment when the country is in full growth and the West is like very happy about what Kenya represents as a democracy and a capitalist nation. So of course we are being treated very well by the rich North. But then, when things get bad, you realize, oh, we have to define who we are and then that questioning of who we are as a nation was almost simultaneous to who I was. All because I left at the same time we were having these deep, deep problems with the dictator. So the art parallels, my art is about my growth as a person but also my seeking to legitimize and discuss art history from a place of honesty. Like, how did Western art get to this point? It not because these while male painters were geniuses and realized how to fragment space, no, something happened. The same thing happened in the Renaissance in some ways a cross pollination created a huge burst of intellectual curiosity. Trade from the East and trade from Africa made all of these questions about the authenticity of that moment fall apart and then you have to reformulate it and then you build things and you discuss things and you discover things and I think thats why I make collage and that why I work the way I do and thats way I ask questions why I am critiquing them and Im always putting myself on the spot while at the same time Im trying to create a deep opinion about what I think should be happening at that moment. Thats also why I do this multi-headed works. Because I know that as Im asking myself a question Im also questioning the question. Or, if Im saying this is how it should be then Im also asking why. Why does it have to be that way, because I say so? 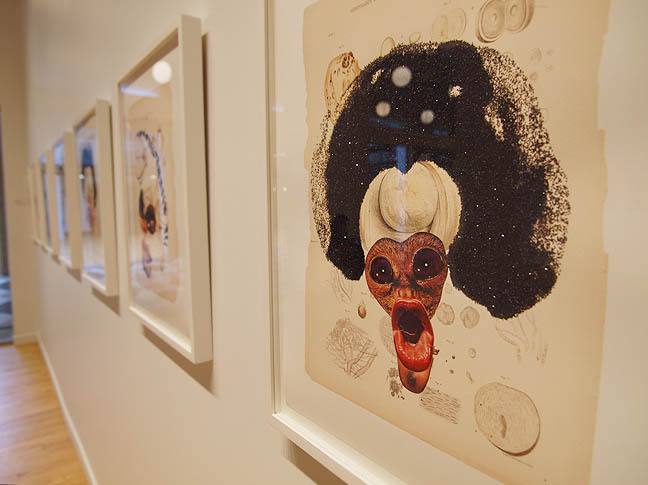 Its allowing for discussion to occur within the work and that in fact that discussion has a particular aesthetic history gets more grounded in African art and how we break up space and open up reality rather than the West has been progressing. V: So, lets do a little bit of time traveling. W: Okay. I thought we just did. V: We did. We did a lot of traveling back to the tributaries you were taking about. But, I wanted to end this interview by thinking a little bit about the future that you see yourself writing maybe not in the Western art canon because it has been exposed as a fraud and maybe not just as a fraud but as a front to something more of an inner textual transmission and appropriation of culture? W: Correct. But, thats what I think it is. Its not so much that its a fraud but that its an admittance that it has relied on so many different histories in order to get thus far. V: So where do you want to take it this open, free, large memory of the past? What is this future youre headed to as an artist? W: I mean to me, one of the things is that I know for a fact is that we are tiny little barnacles in this earth of ours so what we are doing here is minor in the larger realm of what has happened to the Earth. So, what I want to see is more compassion. I want to see more discussion. I want to see more appreciation of culture and learning and people for what they are doing and for what they are as opposed to what they look like or the color of their hair or whatever it is, these funny little things that weve been using as criteria for judging intellectual and artistic prowess have affected the way art history has progressed thus far. I dont know what I want to see. I want to be surprised but I want to see the surprise come from the fact that there are a lot more women intellectuals in universities and there are a lot more, a bigger diversity, of work in museum collections that is challenging the museum and allowing the museum to grow and not just be this kind of archaic vestige and a fearful space that refuses to see that it is a good thing to change and be influenced by different languages, cultures, spaces and people. You know its happening. Im being surrounded by curators of different backgrounds and not just even Black female curators but from around the world because I think its also global and a lot of the issues that were running into that are big. Big questions that will devour and destroy everything including museums. Libraries will disappear if we have environmental havoc. So, for me what my work is trying to say is that we are connected. That art should speak to that connectedness as opposed to a narrow population narrowing down the focal point. The art for arts sake category of artist is a legitimate category but it is not a great time to making that type of work because of the urgent issues in front of us. I think art does that different than a politician speaking to us or even a religious leader or even a celebrity. I think there is something about art that is unassuming that is not trying to convince you of anything but leaves you feeling a lot more empathetic and aware than you came in feeling and I think that is what I would like the future to be about. Divisiveness and categories that encourage elitism and hierarchy can be broken down through art and imagination. So that is what I want to do. I want to play a big role in dismantling. As I like to say, dismantling the little empires inside of our selves. V: Wonderful. Thank you for your time. W: I dont know how youre going to transcribe all of that.